Guide to 19th centure Alexandria of Mohammed Ali; its beautiful and unique palaces and villas that still can be visited and explored. Alexandria was reborn during the 19th century, primarily through Muhammad Ali's efforts to modernize Egypt as a whole. He established a harbour for the country as well as Al-Mahmoudiya Canal as a means to provide the city with fresh water and also as a waterway connection with the Nile. In 1865, a railway between Alexandria and Cairo was erected. Thus, Alexandria regained its position as Egypt's first trading port. The palce is located in Alexandria, Egypt and enjoys an outstanding historical position since it is one of a few palaces that witnessed the initiation of Mohamed Aly's dynasty. It was also where the departure of the ex-monarch Farouk, the family's last heir, took place. A number of foreign engineers, among others, Yezi Bek, his assistant La Vial and Mrs. Le Veroige, were assigned for the construction of the palace. Building activities began in 1834, taking eleven years, until it was completed in 1845. However, complementary work and establishment of additional wings continued until 1847 when Ras el–Teen palace was officially inaugurated. Construction of this palace began in 1919 and finished in 1923. Total aria of the palace with its gardens was 4185 square meters. This palace represents an exotic style of European architecture and art. Now the palace hosts Royal Jewelry Museum. The old Assad Bassili Pasha Palace now hosts The National Museum of Alexandria. Across from the main train station in the area called Kom EI-Dikka, the ancient neighborhood of Raktus. Here you will find Tariq El-Horreyya (or Fouad Street, as it was called before the 1952 Revolution) National Museum of Alexandria housed in the Asaad Bassili Pasha Palace - an architectural monument in its own right. About 15 kilometers east of the Eastern Harbor are the Montazah Royal Gardens. Built as a summer home for Khedive Abbas II, the palace on the grounds is currently used as a presidential residence and is off-limits to the public. However, the surrounding groves and gardens are open to visitors. Situated on a hill overlooking the sea, the 115-acre garden offers a great spot for family picnics. 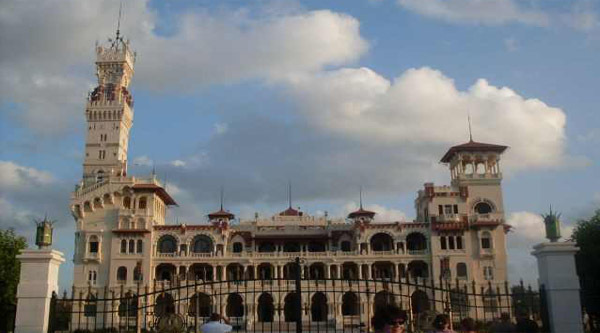 The Antoniadis palace and gardens is another jewel of Alexandria, it is considered to be one of the most beautiful examples of European architecture in the country. In 1860, Greek Baron John Antoniadis commissioned French architect Paul Richard to build a miniature of the Palace Versailles on 50 acres in what is now the Smouha district. The meticulously landscaped palace gardens, dotted with priceless statues of great thinkers and explorers, was the locale for the wedding and honeymoon of the late Shah of Iran and his bride Princess Fawzia. For many years the building was passing between the Alexandria municipality and the Ministry of Agriculture until the beginning of 2004 when the governor of Alexandria donated the building and gardens to the newly established Library of Alexandria, the Bibliotheca Alexandrina, including the furniture and other items. As part of this arrangement, the Villa is to be restored, and its content exhibited as part of the John Antoniadis collection. But already now you can walk in its lush gardens and enjoy the views and the villa, which soon will be completely restored.